An apex Court bench comprising of Chief Justice R.M. 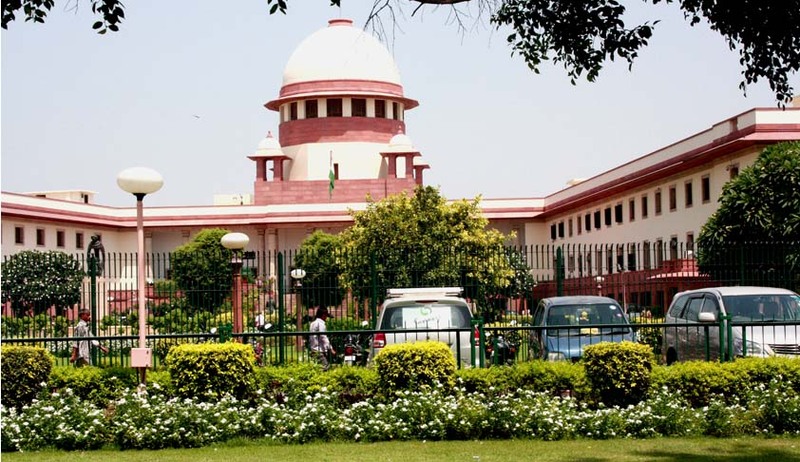 Lodha, Justice Dipak Misra, Justice Madan B. Lokur, Justice S.A. Bobde and Justice Kurian Joseph delivered a land mark judgment on Wednesday, observing that the Prime Minister’s power to choose members of his cabinet cannot be restricted. It has left it to the wisdom of the PM and CMs not to recommend such names to the President and Governor. The writ petition under Article 32 of the Constitution of India was filed by the petitioner, Manoj Narula, as pro bono public assailing the appointment of some of the original respondents as Ministers to the Council of Ministers of Union of India despite their involvement in serious and heinous crimes. The Court interpreted the scope and purpose of Articles 75 and 164 of the Constitution of India regard being had to the text, context, scheme and spirit of the Constitution. Criminalisation of politics was discussed as being an anathema to the sacredness of democracy. Commenting on criminalization of politics, the Bench noted the Court's observation in the case of Dinesh Trivedi, M.P. and others v. Union of India and others, where the faults and imperfections which have impeded the country in reaching the expectations which heralded its conception, were lamented. The Bench asserted, "It is worth saying that systemic corruption and sponsored criminalization can corrode the fundamental core of elective democracy and, consequently, the constitutional governance." In this context, there are recommendations given by different committees constituted by various Governments for electoral reforms. Justice J.S. Verma Committee Report on Amendments to Criminal Law has proposed insertion of Schedule 1 to the 1951 Act enumerating offences under IPC befitting the category of ‘heinous’ offences. It recommended that a provision should be engrafted that a person in respect of whose acts or omissions a court of competent jurisdiction has taken cognizance under Section 190(1) (a), (b) or (c) of the Code of Criminal Procedure or who has been convicted by a court of competent jurisdiction with respect to the offences specified in the proposed expanded list of offences under Section 8(1) shall be disqualified from the date of taking cognizance or conviction, as the case may be. It further proposed that disqualification in case of conviction shall continue for a further period of six years from the date of release upon conviction and in case of acquittal, the disqualification shall operate from the date of taking cognizance till the date of acquittal. Even the Law Commission, in its 244th Report, 2014, has suggested amendment to the 1951 Act by insertion of Section 8B after Section 8A, after having numerous consultations and discussions, with the avowed purpose to prevent criminalization of politics. It proposes to provide for electoral reforms. Article 84 of the Constitution provides for qualifications for membership of Parliament. Article 102 provides for disqualifications for membership. Similarly, Article 173 provides for qualification for membership of the State Legislature and Article 191 enumerates the disqualifications similar to Article 102. The Parliament by the 1951 Act has prescribed further qualifications and disqualifications to become a Member of Parliament or to become a member of Legislative Assembly. Section 8 of the Act stipulates the disqualification on conviction for certain offences. The scheme of disqualification upon conviction laid down by the 1951 Act clearly upholds the principle that a person who has been convicted for certain categories of criminal activities is unfit to be a representative of the people. Criminal activities that result in disqualification are related to various spheres pertaining to the interest of the nation, common citizenry interest, communal harmony, and prevalence of good governance. The Court also considered the "Doctrine of Implied Limitation" with regard to the question that whether taking recourse to this principle of interpretation, this Court can read a categorical prohibition to the words contained in Article 75(1) of the Constitution so that the Prime Minister is constitutionally prohibited to give advice to the President in respect of a person for becoming a Minister of the Council of Ministers who is facing a criminal trial for a heinous and serious offence and charges have been framed against him by the trial Judge. The Court was of the opinion that this would come within the criterion of eligibility and would amount to prescribing an eligibility qualification and adding a disqualification which has not been stipulated in the Constitution. Hence, in the absence of any constitutional prohibition or statutory embargo, such disqualification, in our considered opinion, cannot be read into Article 75(1) or Article 164(1) of the Constitution. With respect to the "Principle of Constitutional Silence or Abeyance", the bench recognised the question to be posed here being whether taking recourse to this doctrine for the purpose of advancing constitutional culture, can a court read a disqualification to the already expressed disqualifications provided under the Constitution and the 1951 Act. The answer was the inevitable negative, for there are express provisions stating the disqualifications and second, it would tantamount to crossing the boundaries of judicial review. Next to be considered was the "Doctrine of Constitutional implications". The Court observed that it was not possible to accept the submission that while interpreting the words “advice of the Prime Minister” it can legitimately be inferred that there is a prohibition to think of a person as a Minister if charges have been framed against him in respect of heinous and serious offences including corruption cases under the criminal law. Besides, the bench also discussed the concept of Constitutional morality, good governance and Constitutional trust. The use of the words “on the advice of the Prime Minister”, as per the Court, could not be allowed to operate in a vacuum to lose their significance. It asserted, "There can be no scintilla of doubt that the Prime Minister’s advice is binding on the President for the appointment of a person as a Minister to the Council of Ministers unless the said person is disqualified under the Constitution to contest the election or under the 1951 Act, as has been held in B.R. Kapur’s case. That is in the realm of disqualification." Two substantive reliefs were claimed in the writ petition. The first relief is for a declaration that the appointment of the Respondents as Ministers in the Government of India is unconstitutional. The second substantive relief was for the framing of possible guidelines for the appointment of a Minister in the Central or State Government. With regard to the second relief, the Court observed, "As far as this substantive relief is concerned, it is entirely for the appropriate Legislature to decide whether guidelines are necessary, as prayed for, and the frame of such guidelines. No direction is required to be given on this subject.". Justice Madan B. Lokur expressed his views on the contentions raised and appreciated the Parliament for making a distinction between an accused person and a convict. (v) It is not for this Court to lay down any guidelines relating to who should or should not be entitled to become a legislator or who should or should not be appointed a Minister in the Central Government.